Masked Intruder, set to release a new EP this July during their run ont he 2016 Warped Tour, have joined Pure Noise Records. 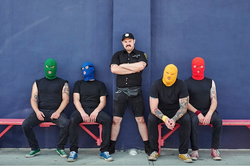 The masked band has previously released records with Red Scare Industries and Fat Wreck Chords. Their last full-length was M.I., released in 2014. SPB spoke with the band around that time.